To control the downhill chip, Gaby Lopez focuses on several things: ball position in the setup, shoulder being parallel to the ground, and clubface angle at impact. OK so we've got an easy line on a downhill. And we've got a real difficult one. Let's walk us through these. So just be aware of how the ball is sitting on the grass. So if it's sitting pretty good, you don't need that much steepness, right? But if it's tough one, you need some steepness so the club can come and pick it up. And so in this one, it's a downhill slide. It's going to go almost no spin. 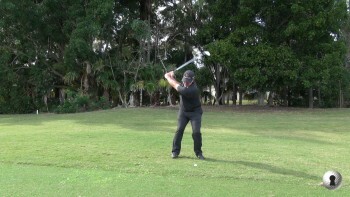 And off the rough, even less spin. So you want in your chest is going to determine exactly where your ball is going to go. 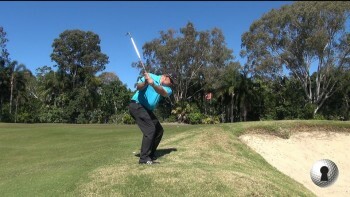 So if you're going downhill, your chest is pointing towards the front part of your stance. If you're going uphill, your chest is going on the back. So that's going to help us a little bit. We want the ball position a little forward. And we want to also cut it. We want to come from the outside so the ball can come up, and not super low with less spin. So we'll see. So hands soft as well, we want to cut this one. And we'll see how much release it's going to get. That one, I cut it a little bit underneath. You'd be OK with that. Well, it kind of got a soft bounce there too. Up a little bit. This is very unpredictable. So you can't go with too much velocity. No, and you have to be aware of, how difficult is the shot? So you can't be mad if you hit it to maybe 10 feet. 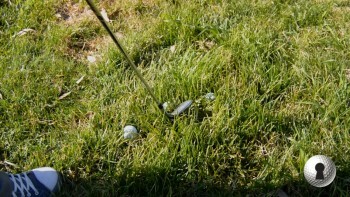 You have to be, OK, I just hit it from a difficult lie. One thing for sure, we don't want to stay up here. Right, so we want to just make sure that the ball is going to pop out. How? By our stance, and by always coming in from the outside-- not from here, but almost from the outside. It's almost like a bunker shot, actually. So I'm going to grip down a little bit, because I'm a little bit closer, I'm bent down a little bit. My face is also stable. And the ball is going to come up with zero spin. And it's going to release. That was awesome right there. That was pretty good. I'm actually good at tough lies than easy lies. Right, so in this one, it's a very nasty one. And you want some steepness. So if you have to also use your wrists to come a little more steep, you can definitely do it. So also, I get down. 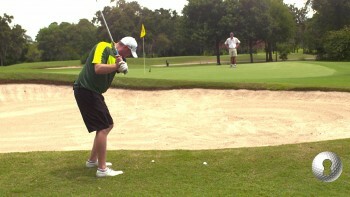 I'm a little bent down, like a bunker shot.